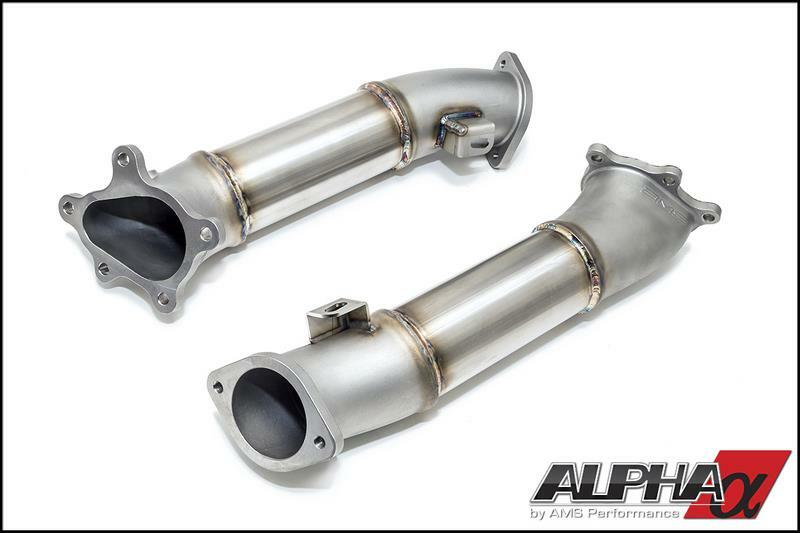 The Alpha Performance Downpipes are the best performing and most durable on the market. During testing we saw gains across the power band with this simple bolt-on! Turbo spool-up was also greatly improved! Our downpipes perform better and are not prone to cracking like the alternatives offered by the competition. Their versions have many welded seams which are prone to failure. By casting these downpipes in robust 304 Stainless Steel we were not limited by the design restraints of hand fabricated construction. The AMS engineering team utilized Solidworks (3D CAD software) to blueprint the inlet and outlets with smoother features and geometry to optimize exhaust flow. They also provided thick flanges to prevent exhaust leaks and utilize the factory mounting hardware for OEM like fitment. Alpha Performance Downpipes offer a more pronounced, throaty exhaust note under wide open throttle yet are subdued at idle and while cruising. A perfectly balanced sound for the ultimate all around supercar! The Alpha Performance Downpipes will easily support any future modifications. Combined with unrivaled fit, finish, durability and performance you can enjoy them for the life of the car. The Alpha Performance Downpipes are the ideal balance of appropriate sizing and geometry resulting in a perfect equilibrium of performance, sound and fitment.